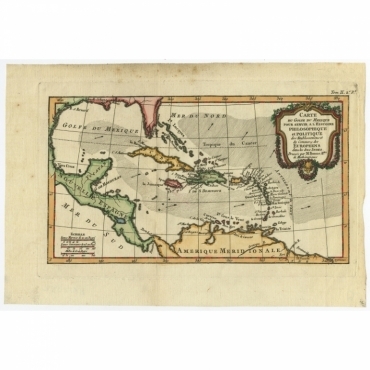 Antique Maps of the Caribbean, Antilles and the West Indies. 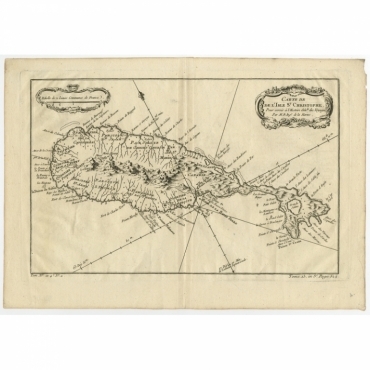 Bartele Gallery offers a wide range of antique maps of islands in the Caribbean sea. This region comprises more than 700 islands. 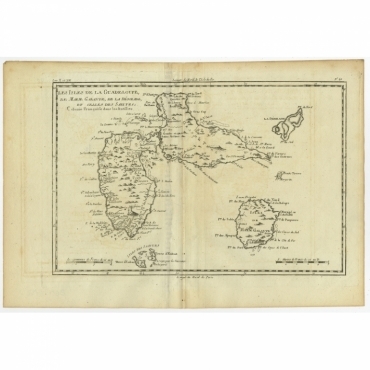 Our collection includes many antique maps of various regions and islands from the 16th to the 20th centuries. Antieke kaarten van de Caraïben, Antillen en West-Indië. Bartele Gallery biedt een grote collectie antieke kaarten van eilanden in de Caraïbische Zee. Deze regio bestaat uit meer dan 700 eilanden. In onze collectie vindt u veel antieke kaarten van deze regio's en eilanden uit de 16e tot de 20e eeuw. 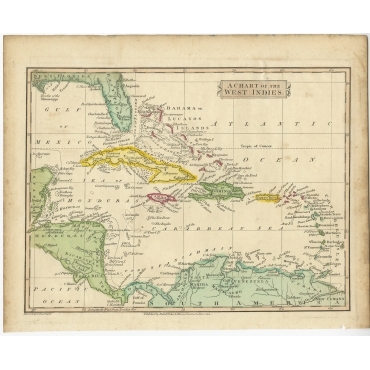 Antique Maps | Caribbean There are 23 products. Antique Map, titled: 'Dominia Anglorum in Praecipuis Insulis Americae (…).' 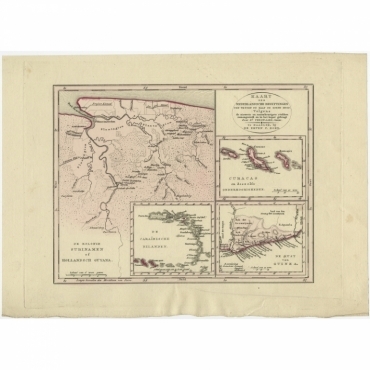 - Five maps on one sheet (Barbados, Bermuda, Jamaica, Antigua and Barbuda, and St. Kitts and Nevis) based on J.B. Homann's map, showing British possessions in the Caribbean. 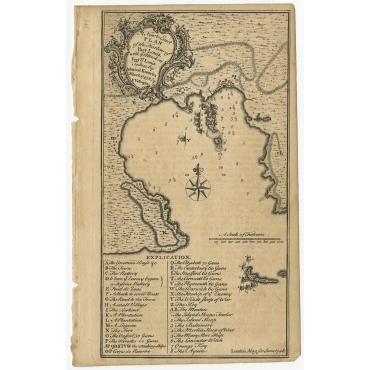 At upper right of the sheet text in German relating to the areas depicted. 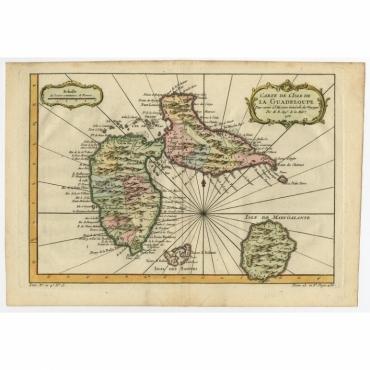 Antique print, titled: 'Carte de L'Isle de la Guadeloupe' - A very decorative map of Guadeloupe in the Caribbean, adorned with rhumb lines, fleur-de-lys, and two decorative rococo-style cartouches. Filled with good detail and place names throughout. 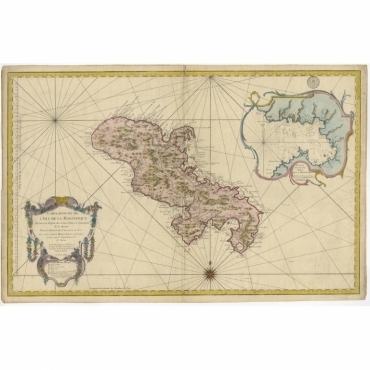 Also includes the islands of Mari-Galante, Terre d'Enhaut, and Terre d'Enbas. 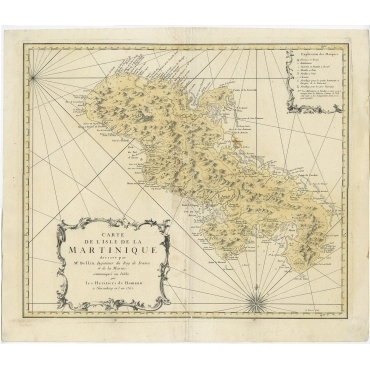 Antique print, titled: 'Carte de l'Isle de la Martinique Colonie Francoise dans les Isles Antilles' - Detailed map og the French Island of Martinique. Many towns and harbours, anchor places, lakes, rivers and mountains are shown. 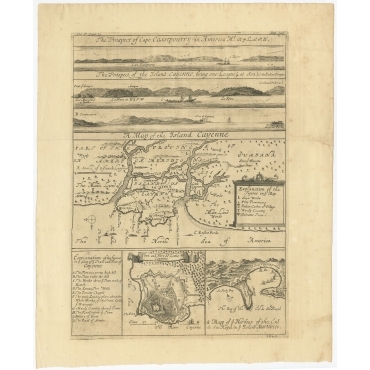 Antique print, titled: 'Het Westindisch Eiland Martenique' - Decorative map of Martinique filled with good detail of roads, topography, soundings, villages, windmills, and plantations. The title cartouche incorporates the distance scales and is garnished with sugar cane. A small compass rose completes the composition. 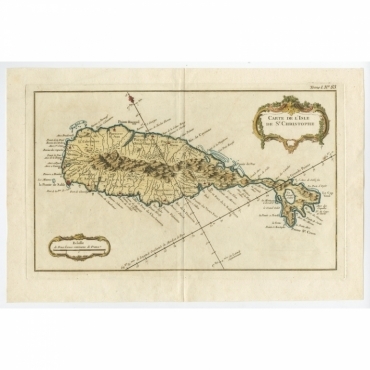 Antique print, titled: 'Carte de l'Isle de Saint-Christophe' - A detailed map of the island of Saint Christopher or St. Kitts showing mountain ranges, port towns and parishes. 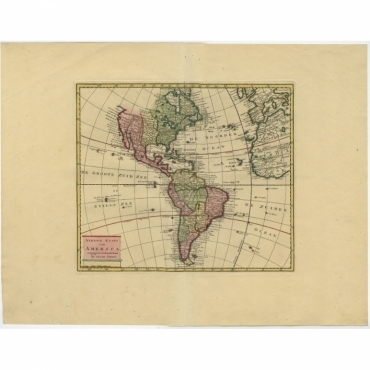 From Bellin's "Le Petit Atlas Maritime, ou Recueil de Cartes et de Plans des Quatre Parties du Monde". 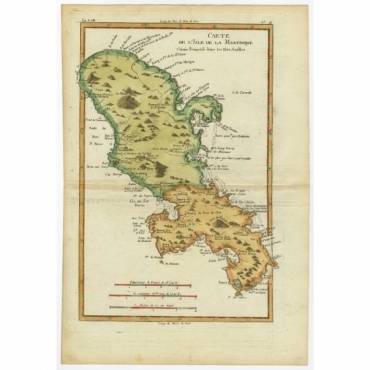 Antique map, titled: 'Les Isles de la Guadeloupe (…).' - Map of the Caribbean Island of Guadeloupe with the surrounding islands Les Saintes, Grand Bourg and La Désirade. 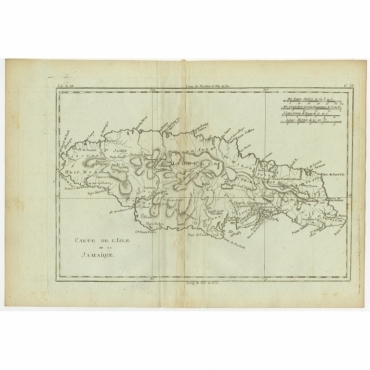 Antique map, titled: 'Carte de l'Isle de la Jamaique.' 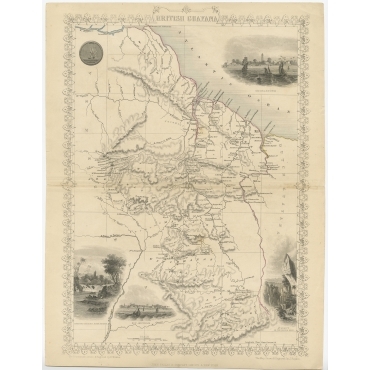 - Highly detailed map of Jamaica, showing towns, rivers, some topographical features, political boundaries and important ports. Antique print, titled: 'Nieuwe Kaart van America.' - Very attractive map of North and South America, the western part of Africa and south west Europe. With full contemporary hand colouring. Antique print, titled: 'Kaart der Nederlandsche Bezittingen (…).' 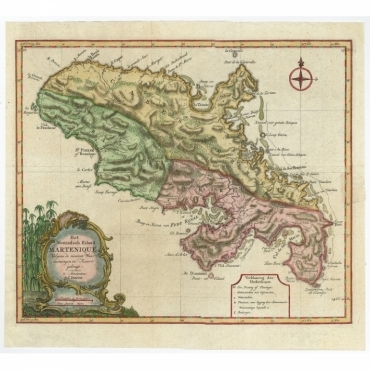 - Uncommon map showing the Dutch posessions in the Caribbean.